Travel around the globe with a stunning RV from RV World MI! Our fantastic prices and incredible staff makes us one of the best Michigan RV dealers! Explore new lands with this New 2019 Starcraft Telluride 296BHS! It's a reliable 5th Wheel with great amenities! You'll find this model and other outstanding models on our lot at 7834 S Division Grand Rapids Michigan 49548! If you would like to talk to one of our RV experts today, call us at 616-591-3632! This RV tows readily with its hitch weight of 1260 lbs, GVWR of 9995 lbs, and dry weight of 8180 lbs! The 2 flush mount slides provide less wind drag! At 34' 0" long and 8' 0" wide, it's easy to handle and set up. You'll have plenty of outdoor living comfort thanks to the 21' 0" patio awning! Don't feel cramped while you camp! 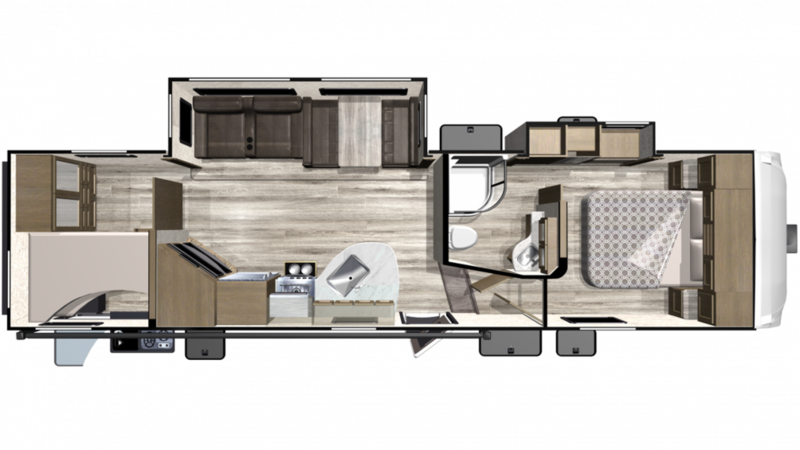 This RV is perfectly spacious for your family, with a length of 34' 0" and width of 8' 0"! At 12' 5" high, you can stand up and walk around without crouching or bumping your head! The 15000 BTU a/c unit and the 18000 BTU furnace keep a stable, comfortable temperature inside this lovely camper! The extra comfortable master bedroom features a snug Queen bed! With all of the cozy furniture inside this RV, you'll be able to sleep a family of 10 people! You can cook up terrific family meals on the road, thanks to the superb, fully appointed kitchen! How about bacon, eggs, and flapjacks for breakfast? You'll whip them up easily on the 3 burner range cooktop, and keep everything fresh and ready in the 8.00 cu. ft. refrigerator! Every meal's a snap! You'll have enough refreshing, clean water for your family's needs with the massive 51 gallon freshwater tank! While you'll be drifting off to sleep in the master bedroom, your kids will be sleeping just as comfortably in the bunkhouse! It features extra cozy Bunkbeds beds, and your kids will love napping, lounging, and hanging out inside! The outdoor kitchen makes picnics, cookouts, and tailgating easy and fun!